Hocking Hills State Park offers a variety of activities for guests and visitors, including hiking, fishing, biking, and swimming. Out-of-town visitors coming for your wedding may choose to stay an extra day or two to explore all that Hocking Hills has to offer, from its mysterious history to its naturalist programs and picnicking spots. You will never run out of beautiful backdrops for your wedding or engagement photos at Hocking Hills State Park. From mysterious gorges to cascading waterfalls, lush forests to rocky outcroppings, Hocking Hills will satisfy any nature lover. Whether you choose to arrive early for a photo session as the sun rises or pose on a cliff at sunset, your pictures are guaranteed to come out beautiful and breathtaking. Weddings should be meaningful, beautiful, and reflect the couple and their loved ones. If nature's beauty is something that calls to your heart, Hocking Hills State Park is the place for you. 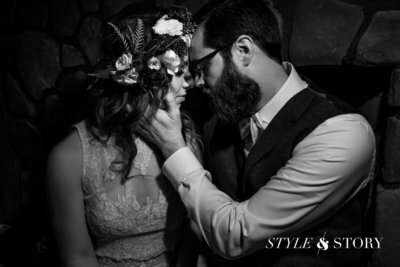 And don't forget to contact our creative team of wedding photographers at Style and Story Creative for information on capturing the special moments and memories from your big day. If you are looking for experienced vendors who can take help take the wedding planning load off your mind and make your event extra memorable, please see our list of preferred vendors. In addition, the Hocking Hills Wedding site also recommends wedding planners, officiants, singers, and adventurous ideas for couples who would like to venture off the beaten path for their wedding or honeymoon. Hocking Hills also boasts over half a dozen restaurants and catering companies including the Utopia Brick Oven Restaurant which offers a wide variety of New American and Italian cuisine, to the civic-minded Catering For A Cause, which offers affordable and excellent catering services and donates its proceeds to food programs in ten counties within Southeast Ohio. Many of the reception and banquet suggestions on the Explore Hocking Hills site have an area reserved to host a memorable Hocking Hills wedding ceremony on site. From the intimate Sky View lodge (accommodating 30 guests outdoors or 12 indoors) to the elegant Ravenwood Castle (accommodating up to 150 guests), each site offers unique features that can appeal to a variety of tastes, styles, budgets, and guest list lengths. Wedding ceremonies and receptions can take place outdoors by a waterfall or within a sentinel of trees, perfect for decorating with strings of lights. 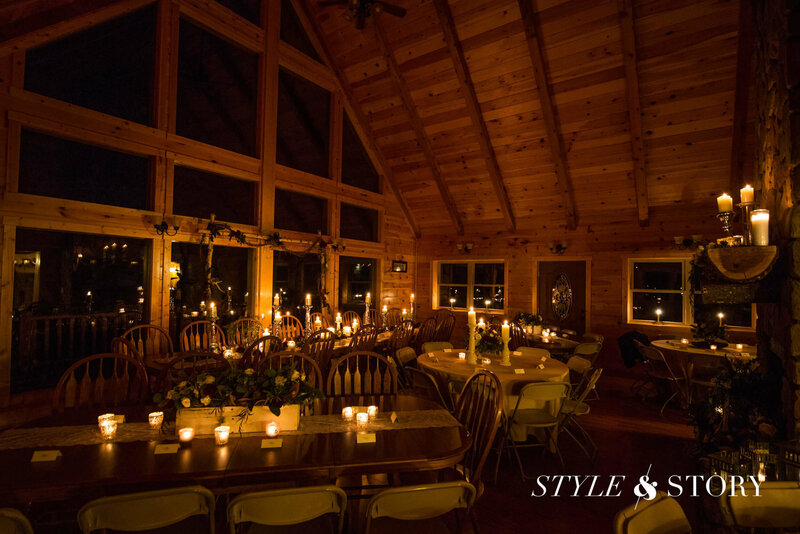 Alternatively, couples may prefer holding their event within any one of the hundreds of lovely cottages, cozy inns, bed and breakfasts, or gorgeous high-ceiling rustic cabins with large windows overlooking the park's breathtaking sights. Nearby restaurants and hotels can also accommodate larger parties or host rehearsal dinners or post-ceremony receptions, even bridal showers and bachelor or bachelorette parties. Are you looking for a natural, beautiful, and flexible event venue in Ohio that will make all of your wedding dreams come true? If so, the Hocking Hills State Park may be the perfect location for you. Nestled in the scenic sandstone region of Southeastern Ohio, the Hocking Hills State Park includes some of the most picturesque areas in the entire state, including breathtaking waterfalls, majestic cliffs, and miles of verdant forests as far as the eye can see. The pristine beauty of the six main park areas is enhanced by the abundance of wildlife such as the wild turkey, white tailed deer, and the cumbersome box turtle that live and thrive in the area. Couples who choose to tie the knot at the Hocking Hills State Park also have a wide variety of venues, caterers, and settings to choose from, easily customizable to a range of tastes and budgets. 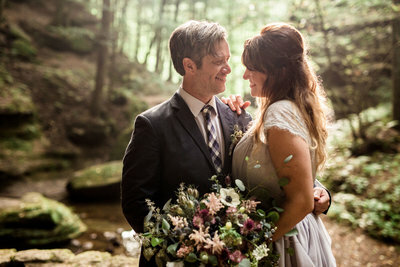 Click to see Abby & David's incredible wedding at Hocking Hills. 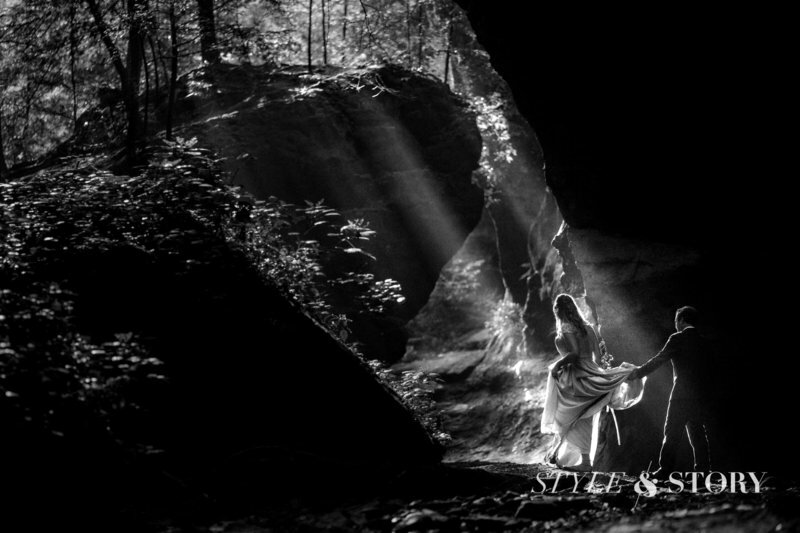 Click to see Chris & Sarah's incredible wedding at Hocking Hills.